A Note to the Readers: Any one who reads the following passages cannot but wonder from where Herodotus would have drawn his information to portray the Indian tribes he mentions here. 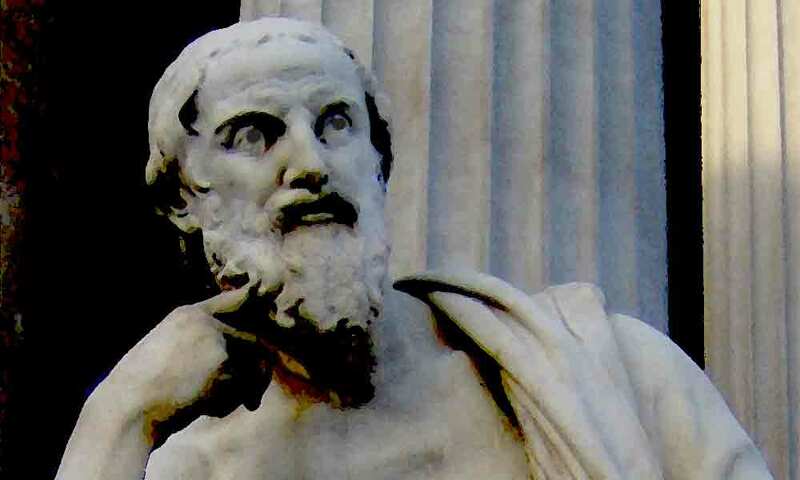 To those who are not familiar, Heordotus was an ancient Greek Historian who gained fame for his monumental work called the Histories (440 BC). Herodotus never visited India and therefore must have relied upon some external source/s to write about the Indian tribes he mentions in these passages. Readers are therefore requested to read these passages with an open mind or for mere amusement and draw their own conclusions. On my part I was almost tempted to name this piece as "The Imaginary India of Herodotus." III.98: The way in which the Indians get the plentiful supply of gold which enables them to furnish year by year so vast an amount of gold-dust to the king is the following: Eastward of India lies a tract which is entirely sand. Indeed of all the inhabitants of Asia, concerning whom anything certain is known, the Indians dwell the nearest to the east, and the rising of the sun. Beyond them the whole country is desert on account of the sand. The tribes of Indians are numerous, and do not all speak the same language---some are wandering tribes, others not. They who dwell in the marshes along the river live on raw fish, which they take in boats made of reeds, each formed out of a single joint. These Indians wear a dress of sedge, which they cut in the river and bruise; afterwards they weave it into mats, and wear it as we wear a breast-plate. III.99: Eastward of these Indians are another tribe, called Padaeans, who are wanderers, and live on raw flesh. This tribe is said to have the following customs: If one of their number be ill, man or woman, they take the sick person, and if he be a man, the men of his acquaintance proceed to put him to death, because, they say, his flesh would be spoilt for them if he pined and wasted away with sickness. The man protests he is not ill in the least; but his friends will not accept his denial---in spite of all he can say, they kill him, and feast themselves on his body. So also if a woman be sick, the women, who are her friends, take her and do with her exactly the same as the men. If one of them reaches to old age, about which there is seldom any question, as commonly before that time they have had some disease or other, and so have been put to death---but if a man, notwithstanding, comes to be old, then they offer him in sacrifice to their gods, and afterwards eat his flesh. III.100: There is another set of Indians whose customs are very different. They refuse to put any live animal to death, they sow no corn, and have no dwelling-houses. Vegetables are their only food. There is a plant which grows wild in their country, bearing seed, about the size of millet-seed, in a calyx: their wont is to gather this seed and having boiled it, calyx and all, to use it for food. If one of them is attacked with sickness, he goes forth into the wilderness, and lies down to die; no one has the least concern either for the sick or for the dead. III.101: All the tribes which I have mentioned live together like the brute beasts: they have also all the same tint of skin, which approaches that of the Ethiopians. Their country is a long way from Persia towards the south: nor had king Darius ever any authority over them. III.102: Besides these, there are Indians of another tribe, who border on the city of Caspatyrus, and the country of Pactyica; these people dwell northward of all the rest of the Indians, and follow nearly the same mode of life as the Bactrians. They are more warlike than any of the other tribes, and from them the men are sent forth who go to procure the gold. For it is in this part of India that the sandy desert lies. Here, in this desert, there live amid the sand great ants, in size somewhat less than dogs, but bigger than foxes. The Persian king has a number of them, which have been caught by the hunters in the land whereof we are speaking. Those ants make their dwellings under ground, and like the Hellene ants, which they very much resemble in shape, throw up sand-heaps as they burrow. Now the sand which they throw up is full of gold. The Indians, when they go into the desert to collect this sand, take three camels and harness them together, a female in the middle and a male on either side, in a leading-rein. The rider sits on the female, and they are particular to choose for the purpose one that has but just dropped her young; for their female camels can run as fast as horses, while they bear burthens very much better. III.104: When the Indians therefore have thus equipped themselves they set off in quest of the gold, calculating the time so that they may be engaged in seizing it during the most sultry part of the day, when the ants hide themselves to escape the heat. The sun in those parts shines fiercest in the morning, not, as elsewhere, at noonday; the greatest heat is from the time when he has reached a certain height, until the hour at which the market closes. During this space he burns much more furiously than at midday in Hellas, so that the men there are said at that time to drench themselves with water. At noon his heat is much the same in India as in other countries, after which, as the day declines, the warmth is only equal to that of the morning sun elsewhere. Towards evening the coolness increases, till about sunset it becomes very cold. III.105: When the Indians reach the place where the gold is, they fill their bags with the sand, and ride away at their best speed: the ants, however, scenting them, as the Persians say, rush forth in pursuit. Now these animals are, they declare, so swift, that there is nothing in the world like them: if it were not, therefore, that the Indians get a start while the ants are mustering, not a single gold-gatherer could escape. During the flight the male camels, which are not so fleet as the females, grow tired, and begin to drag, first one, and then the other; but the females recollect the young which they have left behind, and never give way or flag. Such, according to the Persians, is the manner in which the Indians get the greater part of their gold; some is dug out of the earth, but of this the supply is more scanty. III.106: It seems as if the extreme r egions of the earth were blessed by nature with the most excellent productions, just in the same way that Hellas enjoys a climate more excellently tempered than any other country. In India, which, as I observed lately, is the furthest region of the inhabited world towards the east, all the four-footed beasts and the birds are very much bigger than those found elsewhere, except only the horses, which are surpassed by the Median breed called the Nisaean. Gold too is produced there in vast abundance, some dug from the earth, some washed down by the rivers, some carried off in the mode which I have but now described. And further, there are trees which grow wild there, the fruit whereof is a wool exceeding in beauty and goodness that of sheep. The natives make their clothes of this tree-wool. VII.65: The Indians wore cotton dresses, and carried bows of cane, and arrows also of cane with iron at the point. Such was the equipment of the Indians, and they marched under the command of Pharnazathres the son of Artabates. VII.70. The Eastern Ethiopians---for two nations of this name served in the army---were marshalled with the Indians [probably those who currently speak the Dravidian language Brahui, who presently live in Pakistan, west of the Indus River. ---ed.]. They differed in nothing from the other Ethiopians, save in their language, and the character of their hair. For the Eastern Ethiopians have straight hair, while they of Libya are more woolly-haired than any other people in the world. Their equipment was in most points like that of the Indians, but they wore upon their heads the scalps of horses, with the ears and mane attached; the ears were made to stand upright, and the mane served as a crest. For shields this people made use of the skins of cranes. VII.86: The Medes, and Cissians, who had the same equipment as their foot-soldiers. The Indians, equipped as their foot. men, but some on horseback and some in chariots---the chariots drawn either by horses, or by wild asses.